You haven't been to Lake Louise until you have skated there. Lacing up your skates on a frozen lake is one of the most iconic Canadian activities you will ever do! Glide across the frozen surfaces at the majestic Lake Louise or check out some other cool spots. 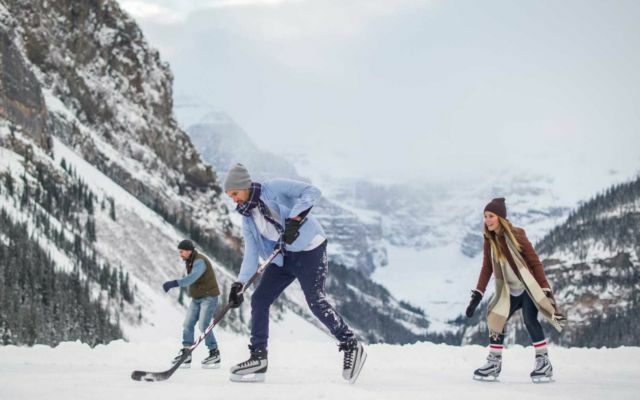 The most scenic and popular of them all, Lake Louise is our pick for ice skating. The whole scene is beautiful with benches for lacing up, outdoor fire pits and a great apres ski lounge at the Chateau. Other hot spots include Banff's Vermilion Lakes and Lake Minnewanka for a natural outdoor skating experience. Visit the friendly faces at Wilson Mountain Sports for your ice skate rentals. They even rent hockey sticks for a game of shinny, pass the puck, or if you need a bit of extra support.